I’ve upgraded the stock pickups (which sucked like no tomorrow) with EMG HZ (passives) H4 on the bridge and H4A on the neck. The pickups are not the best I’ve ever used, but at €55 each and with their absolutely perfect solderless system they are a great investment, though to be honest in my next project guitar I’d rather use Seymour Duncans or EMG Actives. I’ve upgraded the nut to an Earvana one. It’s relatively cheap and it helps solve the intonation issues caused by the first fret which drive me absolutely nut, especially when going from an A chord to a D one. 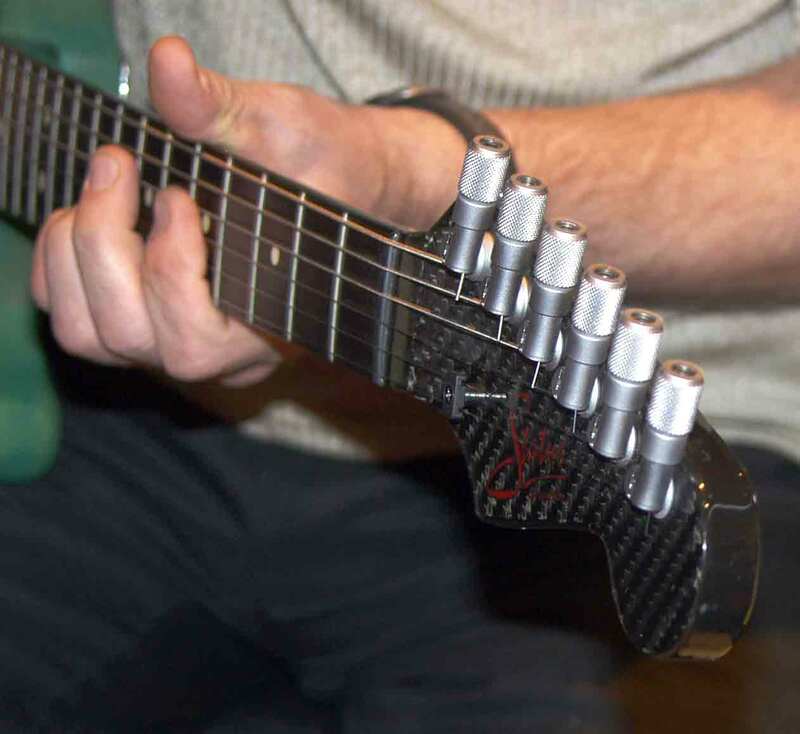 I highly recommend one, however if you are happy with the intonation of your guitar I’d recommend a Graphtech TUSQ (XL) nut. 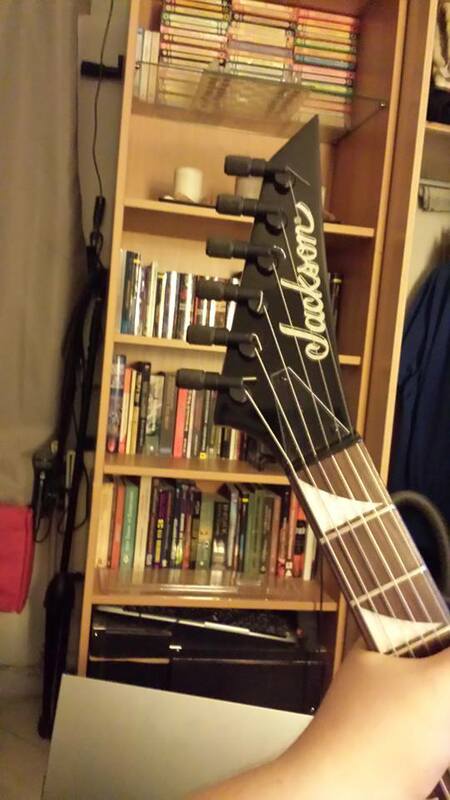 The most important change about this guitar though was the machine heads (the tuners). The guitar doesn’t come with locking tuners, but since I have some kind of locking tuners on all of my other guitars I wanted to have ones on this guitar too. You really cannot compare locking tuners to non-locking ones; even no-name locking tuners are better than any non-locking ones, since they offer better tuning stability and faster string changes. I was between Schallers and Planet Waves. Schallers are good but rather expensive and Planet Waves have a clever system of cutting the excess string when tuning, which, while it sounds good on theory, if you manage to screw up and you need to reattach the string, you’ll have to replace it. The way this works is that the exposed metal pole part on the previous image has a hole for the string like a regular tuner. However, unlike most tuners out there it uses no gears to tighten the string. Instead, you press the string part of the tuner and start twisting the knob until it recedes inside the tuner. Doing so, tightens the string by creating friction between the pole and the casing of the tuner as well as a pin pushed down by the screw in the knob. There is a hex (or Allen, not sure) recess on the head of that screw which you use to fasten the pin to the string. The problem is that the metal of the screw is too soft and it’s very easy to damage the head. You absolutely need to tighten the screw to the string because when tighten the thumb knob, otherwise your string will get out of tune. 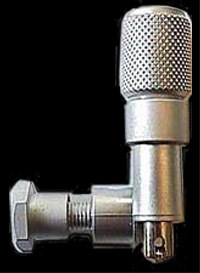 When using Sperzels, Schallers or most other kinds of non-automatic locking tuners, you get a large thumbscrew that’s only used to tighten the pin, plus the knob that actually winds the string. In this implementation you use the thumb knob to “wind” the string and the little screw inside the knob to act as a thumbscrew. As a matter of fact, I managed to almost smooth out the head of one (more like 4) of the tuners. Changing strings 2 more times may lead me to jury-rigging the screw with an ugly custom implementation of some kind; I’m thinking of attaching proper thumbscrews to the tuners when that happens, though I admit it will look worse. Would I recommend these tuners? Not sure. The implementation is lacking, but when you manage to tighten the strings properly, the tuning precision is greater than even the best Schallers out there (similar to Steinbergers actually). Unfortunately, it’s almost impossible to find these tuners anywhere due to them being out of production for some years now (I might have bought the last set in Greece). To be honest, while they look different and awesome, you’ll have way less problems with a set of Schallers or Sperzels or Planet Waves. Update: I wrote about LSR tuners because there seemed to be a general lack of information on the Internet about these tuners. In the end, my advice is to stay away. After having one of the tuners finally broken down, I’ve set them aside until I can think of a way to weld a thumbscrew in the problematic area and replaced them with Schallers. I have these on several of my current guitars, and have had many more with them. I’ve never had a problem with any of them. If you’d like to get rid of the ones you have, please let me know. Thanks, I’d be glad to, but I cannot, in good conscience. I’ve damaged two of the small hex screw-heads already, after tightening these too hard in an attempt to stop the string from slipping. The only solution I have for these now is to find a way to attach a protruding thumbscrew instead of relying on the head screw-heads. I’m still not sure how I’m going to make it still well enough, but a mechanist will find a solution probably. I understand, but I have also been able to repair them. If you’d like to continue on your reengineering of these, I understand that too. Sometimes it’s hard to stop, and fun to keep trying. If you change your mind, please let me know. I know what I am getting myself into.